A windmill is a machine that converts the energy of wind into rotational energy by means of vanes called sails or blades. The reason for the name ‘windmill” is that the devices originally ‘were developed for milling grain for food production; the name stuck when in the course of history, windmill machinery was adapted to supply power for many industrial and agricultural needs other than milling. The windwheel of the Greek engineer Heron of Alexandria in the first century AD is the earliest known instance of using a wind-driven wheel to power a machine. Another early example of a wind-driven wheel was the prayer wheel, which was used in ancient Tibet and China since the fourth century. It has been claimed that the Babylonian emperor Hammurabi planned to use wind power for his ambitious irrigation project in the seventeenth century BC. The first practical windmills had sails that rotated in a horizontal plane, around a vertical axis.According to Ahmad Y. al-Hassan, these panemone windmills were invented in eastern Persia as recorded by the Persian geographer Estakhri in the ninth century. The authenticity of an earlier anecdote of a windmill involving the second caliph Umar (AD 634–644) is questioned on the grounds that it appears in a tenth-century document. Made of six to 12 sails covered in reed matting or cloth material, these windmills were used to grind grain or draw up water, and were quite different from the later European vertical windmills. Windmills were in widespread use across the Middle East and Central Asia, and later spread to China and India from there. Horizontal windmills were built, in small numbers, in Europe during the 18th and nineteenth centuries, for example Fowler’s Mill at Battersea in London, and Hooper’s Mill at Margate in Kent. 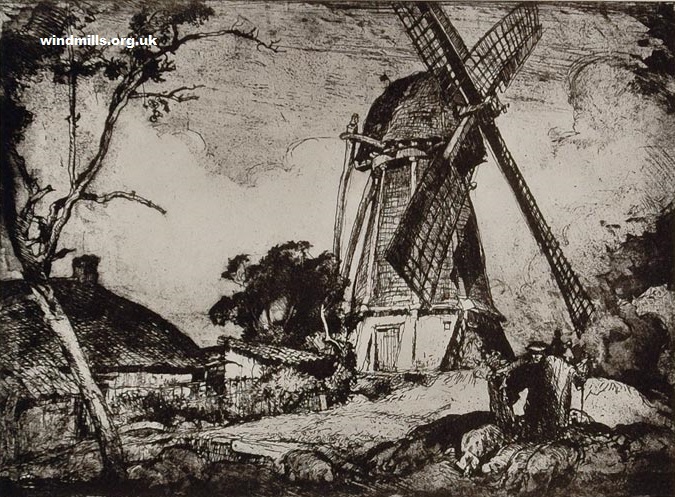 These early modern examples seem not to have been directly influenced by the horizontal windmills of the Middle and Far East, but to have been independent inventions by engineers influenced by the Industrial Revolution. Debate occurs among historians as to whether or not Middle Eastern horizontal windmills triggered the original development of European windmills. In northwestern Europe, the horizontal-axis or vertical windmill (so called due to the plane of the movement of its sails) is believed to date from the last quarter of the twelfth century in the triangle of northern France, eastern England and Flanders. The evidence at present is that the earliest type of European windmill was the post mill, so named because of the large upright post on which the mill’s main structure (the “body” or “buck”) is balanced. By mounting the body this way, the mill is able to rotate to face the wind direction; an essential requirement for windmills to operate economically in north-western Europe, where wind directions are variable. The body contains all the milling machinery. The first post mills were of the sunken type, where the post was buried in an earth mound to support it. Later, a wooden support was developed called the trestle. This was often covered over or surrounded by a roundhouse to protect the trestle from the weather and to provide storage space. This type of windmill was the most common in Europe until the nineteenth century, when more powerful tower and smock mills replaced them. By the end of the thirteenth century, the masonry tower mill, on which only the cap is rotated rather than the whole body of the mill, had been introduced. The spread of tower mills came with a growing economy that called for larger and more stable sources of power, though they were more expensive to build. In contrast to the post mill, only the cap of the tower mill needs to be turned into the wind, so the main structure can be made much taller, allowing the sails to be made longer, which enables them to provide useful work even in low winds. The cap can be turned into the wind either by winches or gearing inside the cap or from a winch on the tail pole outside the mill. A method of keeping the cap and sails into the wind automatically is by using a fantail, a small windmill mounted at right angles to the sails, at the rear of the windmill. These are also fitted to tail poles of post mills and are common in Great Britain and English-speaking countries of the former British Empire, Denmark, and Germany but rare in other places. Around some parts of the Mediterranean Sea, tower mills with fixed caps were built because the wind’s direction varied little most of the time. The smock mill is a later development of the tower mill, where the tower is replaced by a wooden framework, called the “smock.” The smock is commonly of octagonal plan, though examples with more, or fewer, sides exist. The smock is thatched, boarded or covered by other materials, such as slate, sheet metal, or tar paper. The lighter construction in comparison to tower mills make smock mills practical as drainage mills as these often had to be built in areas with unstable subsoil. Having originated as a drainage mill, smock mills are also used for a variety of purposes. When used in a built-up area it is often placed on a masonry base to raise it above the surrounding buildings. Common sails consist of a lattice framework on which a sailcloth is spread. The miller can adjust the amount of cloth spread according to the amount of wind available and power needed. In medieval mills, the sailcloth was wound in and out of a ladder type arrangement of sails. Postmedieval mill sails had a lattice framework over which the sailcloth was spread, while in colder climates, the cloth was replaced by wooden slats, which were easier to handle in freezing conditions. The jib sail is commonly found in Mediterranean countries, and consists of a simple triangle of cloth wound round a spar. In all cases, the mill needs to be stopped to adjust the sails. Inventions in Great Britain in the late eighteenth and nineteenth centuries led to sails that automatically adjust to the wind speed without the need for the miller to intervene, culminating in patent sails invented by William Cubitt in 1813. In these sails, the cloth is replaced by a mechanism of connected shutters. In France, Pierre-Théophile Berton invented a system consisting of longitudinal wooden slats connected by a mechanism that lets the miller open them while the mill is turning. In the twentieth century, increased knowledge of aerodynamics from the development of the airplane led to further improvements in efficiency by German engineer Bilau and several Dutch millwrights. The majority of windmills have four sails. Multiple-sailed mills, with five, six or eight sails, were built in Great Britain (especially in and around the counties of Lincolnshire and Yorkshire), Germany, and less commonly elsewhere. Earlier multiple-sailed mills are found in Spain, Portugal, Greece, parts of Romania, Bulgaria, and Russia. A mill with an even number of sails has the advantage of being able to run with a damaged sail and the one opposite removed without resulting in an unbalanced mill. Gears inside a windmill convey power from the rotary motion of the sails to a mechanical device. The sails are carried on the horizontal windshaft. Windshafts can be wholly made of wood, or wood with a cast iron poll end (where the sails are mounted) or entirely of cast iron. The brake wheel is fitted onto the windshaft between the front and rear bearing. It has the brake around the outside of the rim and teeth in the side of the rim which drive the horizontal gearwheel called wallower on the top end of the vertical upright shaft. In grist mills, the great spur wheel, lower down the upright shaft, drives one or more stone nuts on the shafts driving each millstone. Post mills sometimes have a head and/or tail wheel driving the stone nuts directly, instead of the spur gear arrangement. Additional gear wheels drive a sack hoist or other machinery. The machinery differs if the windmill is used for other applications than milling grain. A drainage mill uses another set of gear wheels on the bottom end of the upright shaft to drive a scoop wheel or Archimedes’ screw. Sawmills use a crankshaft to provide a reciprocating motion to the saws. Windmills have been used to power many other industrial processes, including papermills, threshing mills, and to process oil seeds, wool, paints and stone products. The total number of wind-powered mills in Europe is estimated to have been around 200,000 at its peak, which is modest compared to some 500,000 waterwheels. Windmills were applied in regions where the was too little water, where rivers freeze in winter and in flat lands where the flow of the river was too slow to provide the required power. With the coming of the industrial revolution, the importance of wind and water as primary industrial energy sources declined and were eventually replaced by steam (in steam mills) and internal combustion engines, although windmills continued to be built in large numbers until late in the nineteenth century. More recently, windmills have been preserved for their historic value, in some cases as static exhibits when the antique machinery is too fragile to put in motion, and in other cases as fully working mills. More about exactly how a windmill works. If you share our interest in the mills of England and most especially past and surviving windmills in Somerset, south-west England, do get in contact.